Location: On the south side of Wood Lane at its junction with Halton Station Road. Present state: Station building in use as private dwelling. Up platform still in situ. Halton station was situated on the Birkenhead, Lancashire & Cheshire Joint Railway’s (BLCJR) Warrington and Chester line which opened on the 31 October 1850. Halton station did not open with the line but following a serious railway accident that took place in the Sutton Tunnel on the 30 April 1851. A report by Captain R E Laffan recommended that a station be opened at each end of the tunnel and that they be linked together by electric telegraph. Halton was the station provided at the southern end of the tunnel and it first appeared in the public timetable with the name ‘Runcorn’ in March 1852. The station was located on the south side of a road overbridge which carried Wood Lane over the line. The BLCJR was a double-track railway so Halton was provided with two platforms. The station’s main facilities were located on the up (Chester direction) platform. They consisted of a two-storey villa in a restrained cottage orné style with attractive bargeboards surmounted by finials and a ground-floor canted bay on the platform elevation. An approach road connected the main station building with the public highway. Access to the down platform (Warrington direction) was via a set of steps that linked to the road overbridge. The station had goods facilities in the form of two sidings on the up side of the line. A 5-ton crane and a weighing machine were provided. At the time of opening the station was served by three trains in each direction between Chester and Manchester Victoria. On 1 August 1859 the BLCJR became the Birkenhead Railway but within a matter of months it was taken over jointly by the Great Western Railway (GWR) and the London & North Western Railway (LNWR) as the Birkenhead Joint Railway (BJR) on the 1 January 1860. In April 1861 the new company renamed the station ‘Runcorn Road’. The GWR used the line through Halton as a means of access to Manchester via Warrington and lines belonging to the LNWR. The LNWR ran express services over it but Halton station was served mostly by local trains. By 1863 Runcorn Road was being served by four trains in each direction on Monday-to-Saturday and two each way on Sunday. On 1 April 1869 the LNWR opened a line between Ditton Junction and Weaver Junction which passed over the River Mersey on a high level bridge. The new line was provided with a station at Runcorn and for that reason the BJR renamed ‘Runcorn Road’ as ‘Halton’ on 1 March 1869. On 4 June 1869 an Agreement was approved with John Nichols by the BJR for a private siding at Sutton Dock on the Weston Canal (River Weaver Navigation). 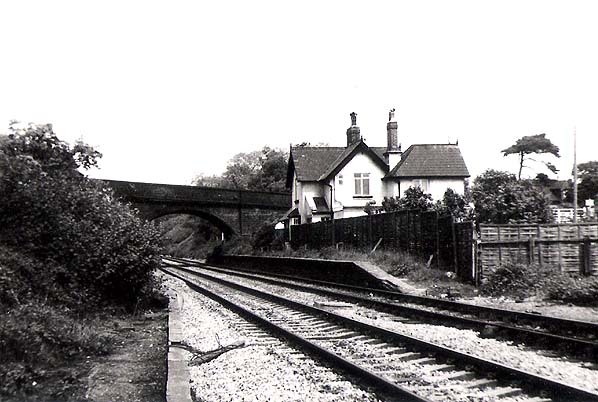 The siding was more like a short branch line and it connected to the main line just south-west of the station. A signal box was provided to control the junction. The box was a LNWR & GWR Type 1 constructed from brick and was located on the up side of the line. Both the Sutton Dock line and the signal box had opened by 1872 (Click here to read more about the Sutton Dock Branch). On 1 May 1873 the LNWR opened a line between the BJR (at Frodsham Junction) and its Ditton Junction – Weaver Junction line (at Halton Junction). The new line connected to the BJR in a westward-facing direction 31 Chains to the south-west of Halton station. A further signal box was opened to control the junction. Named ‘Frodsham Junction’ the box which opened on 25 November 1872 was located on the up side of the line and it was yet another LNWR & GWR Type 1. It was provided with a 20-lever frame. 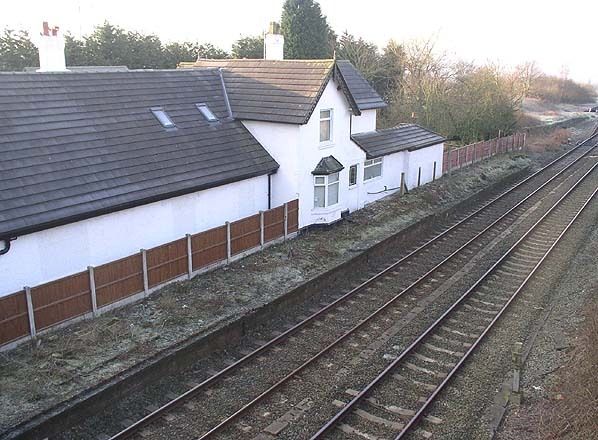 In June 1893 the original Frodsham Junction signal box was closed and replaced with an LNWR Type 4 structure with a brick base and timber upper cabin. The new box was equipped with an LNWR 32-lever Tumbler frame. The December 1895 timetable showed seven up and six down trains Monday-to-Saturday and two each way on Sundays. In July 1898 the signal box at Sutton Dock junction closed and was replaced with an LNWR Type 4 brick base and timber upper cabin structure which was given the name ‘Halton’. The box had a 40-lever LNWR Tumbler frame. Goods loops were also installed around the same time that stretched from the south-west of the station to Frodsham Junction. The 1904 Handbook of Stations listed Halton as being able to hande parcels, general goods, livestock, horse boxes and prize cattle vans and carriages by passenger train. In June 1913 Frodsham Junction signal box was replaced once again this time with an LNWR Type 5 structure. The new box was located on the down side of the line in the fork of the junction. The frame from the 1893 box was transferred to the new one. The July 1922 timetable showed seven up services Monday-to-Friday and six on Saturdays. In the down direction there were six trains Monday-to-Saturday. On Sundays there were two trains in each direction. In 1923 the LNWR share in the joint line passed to the London, Midland & Scottish Railway (LMS) who absorbed the former company as part of the ‘Grouping’ of the country’s many railway companies into four large organisations. The GWR retained its own identity. 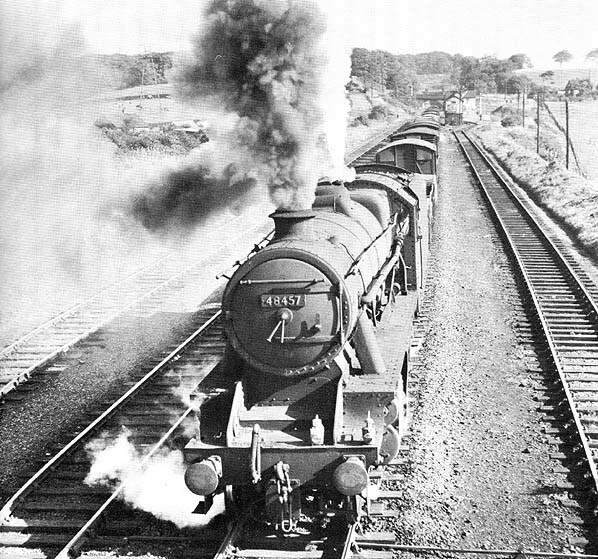 The LMS summer timetable for 1932 showed six up trains Monday-to-Friday and seven on Saturdays. In the down direction there were four trains Monday-to-Friday and six on Saturdays. On sundays there was just one down train which departed at 7.35am and ran to Manchester Exchange. By 1947 the LMS was running only six up and four down trains from Halton on weekdays as shown in the table below. On Saturday there was an extra down train and on Sunday two up and one down services. At the nationalisation of Britain’s railways on 1 January 1948 Halton became part of British Railways [London Midland Region] (BR[LMR]). The first BR[LMR] summer timetable published showed a largely unaltered service. BR[LMR] considered Halton station to be unremunerative and it closed to passengers on 7 July 1952; it continued to be used for goods until 3 February 1964. 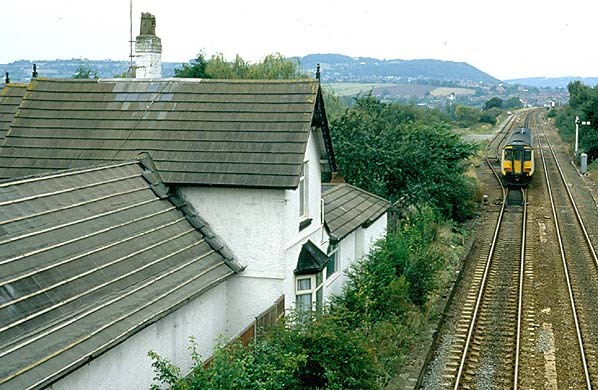 The goods sidings had been removed by 1965 as had the Sutton Dock Branch which probably closed around the same time as the goods facilities at the station. The line remained open and the station passed into private ownership. Halton signal box closed on 2 July 1967. Both of the platforms were extant into the 1970s but the down had been demolished by the mid 1980s. The station building and the up platform were extant in 2016 but the building had been altered and extended. A view looking east towards Halton station in 1967. The station had been closed to passengers for fifteen years but it still retained its original features. Only the goods yard sidings had been lifted. Halton station shown on a twenty-five inch map from 1872. 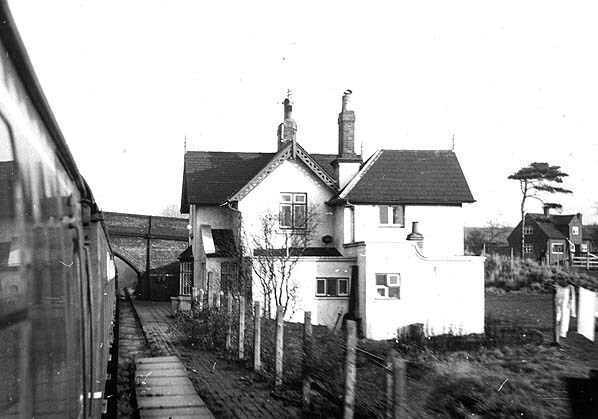 At this time the station had a signal box which can be seen to the north of the station building. The goods facilities are also clearly illustrated on the map. On this twenty-five inch scale map from 1897 the wider area around Halton station is shown. The junction for the Sutton Dock siding and the Halton signal box can be seen bottom left. Halton station shown on a Railway Clearing House map from 1915. The BJR is shown as red and yellow. In red are the lines of the LNWR. The map also shows the Sutton Tunnel. An accident in the tunnel in 1850 led to the creation of Halton and Norton stations which were linked by electric telegraph to improve safety. Halton station seen from an up train in the 1960s. Looking north-east towards Halton station in 1965. In the distance is the Halton signal box and beyond that the station which was closed by this time. Passing through is a Healy Mills to Birkenhead freight service. At the head of the train is 8F 2-8-0 locomotive number 48457. 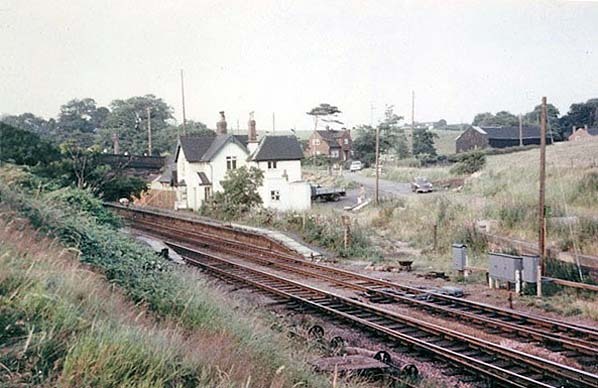 A view of Halton station looking north-east in 1970. Looking south-west towards Frodsham Junction from Halton station on 30 September 1995. Halton station looking south-west in February 2005. The bricked up entrance that had led to the down platform at Halton station seen on 5 August 2010.
to Fiddlers Ferry coal train. 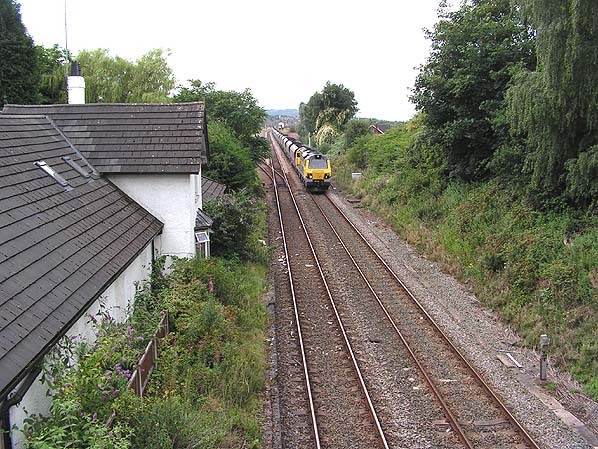 The signal box at Frodsham Junction can be seen in the distance. 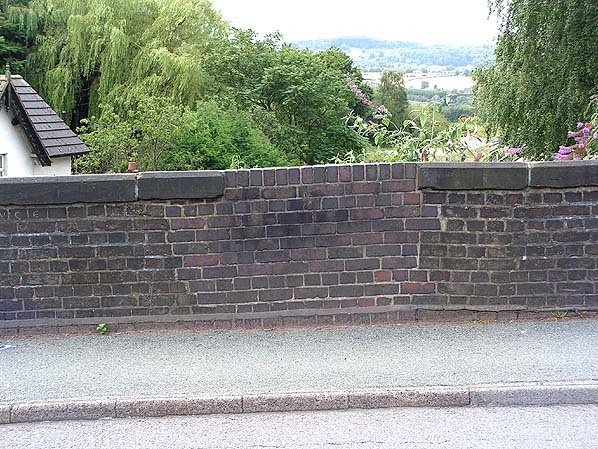 the Halton Curve (the 1 mile 54 chain Frodsham Junction – Halton Junction line). To read more about the Halton Curve click here.